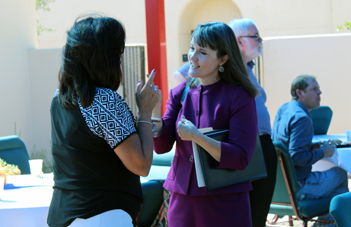 The new Superintendent of Arizona State Schools for the Deaf and the Blind has extensive experience in education and community service—and is one of the few very Deafblind administrators to head a school for the deaf and the blind. Here’s DEAF LIFE’s complete interview. I grew up on a small family farm in western Nebraska, and attended public school in the nearby town of Big Springs, Nebraska. My parents didn’t discover that I was deaf until I was six years old. At that time, my parents got me two hearing aids, some speech therapy, and kept me in the local school. (The Nebraska School for the Deaf was in Omaha, about 300 miles to the east, and my parents didn’t want to send me that far away.) My mother was my tutor until I was 10-years- old. Each night she taught me how to read and write, as well as foundational math skills (addition, subtraction, multiplication and division). After graduating from NSVH, I chose to enroll at Gallaudet University for my undergraduate degree. It was at Gallaudet where I acquired proficiency in American Sign Language as a second language, developed socio-emotional skills and made friends, and began my career path. With an undergraduate degree in Psychology from Gallaudet University, I moved on to University of Arizona to obtain a M.S. degree in Rehabilitation Counseling. What inspired you to choose a career in education and advocacy? I actually began my career in adult services, working with the local Deaf community first in Tucson, Arizona as a mental health counselor for several years at Community Outreach Program for the Deaf (COPD) and then in Phoenix, Arizona as an Agency Director of Valley Center of the Deaf (VCD) for 8 years. At that time, VCD provided employment-related services, independent-living-skills services, advocacy services, and telecommunication relay services. From working with adults who are deaf and hard of hearing, I have observed the direct relationship between educational outcomes and post-graduation outcomes. Students who are deaf and hard of hearing and blind and visually impaired transition from high school to adult life must have academic skills, knowledge of the working world and career choices, and social/emotional maturity to successfully navigate postsecondary education and training opportunities and to be successfully employed in good paying jobs. ASDB has a responsibility to offer a high-quality education to its students. As the new superintendent, I am focused on setting up a culture of high expectations for all students. I’d like to know more about your work at OSERS. In 1999, I was offered a position to replace Dr. Vic Galloway as the Chief of Deafness and Communicative Disorders Branch (DCDB) of the Rehabilitation Services Administration (RSA), a unit in the U.S. Department of Education’s Office of Special Education and Rehabilitative Services (OSERS). During the next six years, I worked extensively with State Coordinators for the Deaf (SCDs) in state Vocational Rehabilitation (VR) agencies throughout the country to improve VR services for consumers who are Deaf, hard-of-hearing, deaf-blind, and late-deafened. In 2005, RSA went through a reorganization that eliminated DCDB, and I was given the opportunity to transfer to OSERS’ Office of Special Institutions (OSI). For the next eleven years, I closely monitored Gallaudet University, National Technical Institute for the Deaf (NTID), and the American Printing House for the Blind (APH) on their use of the annual Federal appropriations. The monitoring focused on compliance with relevant requirements and on qualitative reviews to ensure that high quality education programming, services, and products were being provided. What is your vision for ASDB? What do you plan to do? What changes do you plan to make? Arizona State Schools for the Deaf and the Blind (ASDB) is a state agency that includes three schools—Arizona School for the Deaf (ASD), Arizona School for the Blind (ASB), and Phoenix Day School for the Deaf (PDSD)—as well as five regional centers that provide services to students who are Deaf, hard-of -hearing, blind, and visually impaired in local public schools. ASDB also has an early-intervention program that provides in-home services to families with infants and toddlers, from birth to age three, who are deaf and/or blind, and two preschool programs for students ages three to five. I believe that the ultimate outcome for students who attend ASDB schools and/or receive services from ASDB in the local schools should be that they are college- and career-ready upon graduation. That is, ready for life - ready to be a fully contributing member of the community with the academic and technical skills for gainful employment; the social emotional skills to navigate relationships in the workplace and with families and friends; and the self-determination and advocacy skills to successfully obtain appropriate accommodations. ASDB is embarking on a journey that includes the development of a new strategic plan that will identify critical areas that the agency must focus on during the next five years. The strategic-planning process will: (1) guide the establishment of a culture of high expectations, one that focuses on post-school outcomes which demonstrate a successful transition to postsecondary educational opportunities and/or good paying jobs; (2) increase the engagement of the parents with their children’s education; and (3) realign early intervention services to provide immediate access to a native language and language fluency after birth for those who are deaf and hard of hearing and learning through nonvisual means and independent living skills for those who are blind and visually impaired. How does your experience with the Deaf and Blind communities give you an advantage? As a student at NSVH, I had teachers who adhered to a rigorous curriculum and who had high expectations. In fact, my English teacher gave us at minimum two hours of homework each evening. I also had a math teacher who taught algebra, geometry, and introduction to trigonometry. My classmates were blind and visually impaired, and they taught me how they learned and navigated their world through nonvisual means. When I graduated, I was well prepared for college coursework and had no difficulty with classes at Gallaudet University. It was at Gallaudet University I acquired fluency in American Sign Language (ASL), made friends with others (for the first time) who were deaf (like me), and met faculty who actively encouraged me to think about graduate school. As a first-generation college student, I hadn’t previously even considered enrolling into a graduate program. After completing my master’s degree, I started my career at Community Outreach Program for the Deaf and later at Valley Center of the Deaf in Phoenix, Arizona by working with the deaf community. In addition, I was active in the local Greater Tucson Advisory Council of the Deaf, Tucson Association of the Deaf, and in Arizona Association of the Deaf. These experiences gave me an appreciation of and a personal understanding of the grassroots community. When I moved to Washington, DC to work for the U.S. Department of Education, I witnessed first-hand how the Rehabilitation Act of 1973 and subsequent amendments were translated into regulations and policies, directly impacting how states provide Vocational Rehabilitation services to Deaf/hard-of-hearing and blind/visually impaired individuals. Through my work monitoring Gallaudet University, NTID, and APH, I gained an understanding of how the Education of the Deaf Act mandated how Gallaudet University and NTID provided postsecondary education to their students and how the 1873 Act to Promote the Education of the Blind defined what work APH was to perform. By focusing on qualitative and programmatic reviews (in addition to compliance review), I was able to determine whether the special institutions were using their federal funds efficiently and effectively, in order to ensure the provision of high quality education programming, services, and products. I believe that these experiences will serve me quite well as superintendent in being accountable for the use of funds appropriated to ASDB by the State of Arizona and other funding sources and to ensure ASDB students receive access to a high-quality education. What do you most enjoy doing in "leisure time"? When I can get away, I love to travel internationally. I have been to Japan, China, the Bahamas, Spain, Russia, Finland, the three Baltic countries (Estonia, Latvia, and Lithuania), South Africa, Peru, Bhutan, and Nepal. The next trip, hopefully, is to Myanmar (Burma).